“For we cannot but speak the things which we have seen and heard” (Acts 4:20). “And the multitude of them that believed were of one heart and of one soul: neither said any of them that ought of the things which he possessed was his own; but they had all things common” (Acts 4:32). Back in the book of Acts again. Great stuff! The New Testament or Apostolic Church was anything but ORDINARY. Those early followers of Jesus were radicals who gave themselves passionately to seek Christ and to spread the Good News of Christ. They were men of conviction, compassion, and great courage. They lived simply, sacrificially, and were willing to suffer for the cause of Christ and the Christ of the cause! One simply cannot read the Gospels, nor read the Book of Acts and come to any other conclusion than Jesus and His followers were radicals and were a part of a radical revolution! Those early followers of Jesus were not reluctant disciples, but radical disciples who lived in light of eternity! These men and women knew and understood clearly Who Jesus Christ was, what His cause was all about, and the great cost that would come with following Christ. They signed up anyway and gave themselves unreservedly “for the Gospel’s sake” (1 Corinthians 9:23)!!! Where did the early church get this lifestyle? By walking with Jesus and walking with men and women who walked with Jesus. They definitely didn’t get it by signing up for the status quo!!! 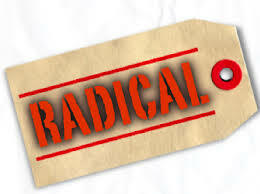 If we are going to be radical for Jesus, if we are going to be a part of a radical revolution in our part of the world today, we are going to have to walk with the Radical One, and with those who are walking with, loving, and serving the Radical One!